Are you already panicking about what to buy your friends and family for the holidays this year? Don't. First of all, it isn't even December yet, and second of all, we've assembled yet another guide of 20 great gift ideas for the people in your life who know receiving toys on Christmas never goes out of style. There are only about a million items designed to look like the Doctor's TARDIS, but few of them are as functional as this adorable tinymini-fridge from ThinkGeek. It actually plays the TARDIS sound when you open and close the door, and can switch from cold to hot in case you prefer your jelly babies warm. It's $80, and you can order it here. Easily the biggest badass on the show — and pretty much the only character who's been likeable the entire time — Daryl Dixon is the main reason TWD is such a hit. McFarlane Toys has released this 10-inch figure made with a full-body 3D scan of actor Norman Reedus himself. It's all the protection from Walkers your toys will ever need. He's $30-40 at mst online retailers. Everyone can be worthy to wield the power of Thor thanks to Hasbro's Thor: The Dark World soft foam hammer, because everyone can lift this lightweight Mjolnir. The Nerf hammer of the gods is soft enough that you can hit your adopted brother in the face with it and do little to no damage (your adopted brother should be a god of mischief, though, or else your parents probably won't be forgiving). It's $13 at most toy stores. Anyone who hasd ever had to make a saving throw against inebiration will surely appreciate these whiskey stones, shaped like 20-sided dice. They freeze so you can put them in your beverage of choice, chilling it but without watering it down as ice does. A set of two are available at ThinkGeek for $20. Despite the allure of the D20 whiskey stones, sometimes you really want ice in your beverage — and sometimes, you want that ice to be nerdy. Diamond Select has the market cornered on nerdy ice trays, with The Walking Dead, Back to the Future, Ghostbusters, Star Trek, and much, much more, all shaped into various characters, vehicles, logos and more, all for only about $15 each. Barbie knows what's it's like to have to kill others for her own survival (what do you think happened to Skipper?). 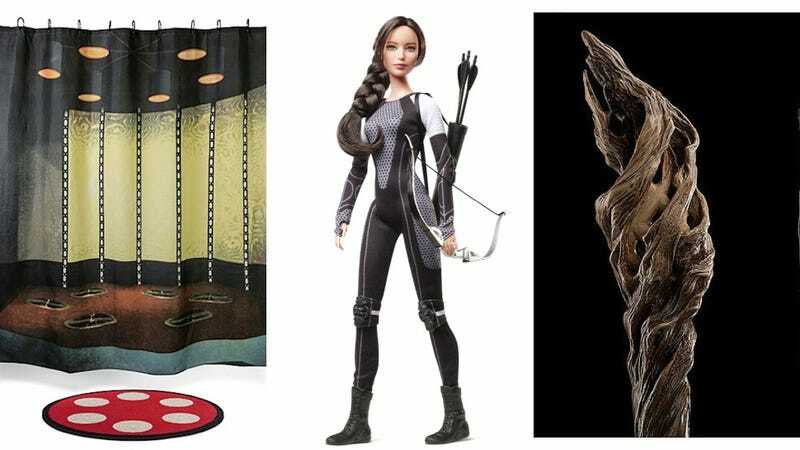 So celebrate her survival with the shockingly good-looking Barbie as Katniss doll in her new Hunger Games uniform. Peeta, Finnick and Effie are also available for $25 each (it should be noted that Finnick is not quite as movie accurate as Katniss). Few people remember that Chewbacca was the progenitor of the man-purse, well before it was considered cool. But what can I say? The Wookiee was an iconoclast. But you can pay homage to his fashion forward thinking with this faux leather replica, complete with bandolier strap. It's $90 here. The most advanced Lego set ever, the new Mindstorms system allows young mad scientists the ability to make five pre-set robots and millions of their own unique creations, each with the ability to move, talk, touch, sense color, and more — and all controlled on your smartphone. The set is $350. Good versus evil clash in this special action figure set from DC collectibles. It includes Batman iun all black, The Flash with a metallic sheen, an updated Aquaman, Black Manta, the New 52 version of Captain Cold, the New 52 Catwoman (baring her New 52 cleavage) and the new Joker with his severed face tied to his head from Death of the Family. The set goes for $100 here. At the pointy where science and music collide, there lies the Theremin. This Japanese kit is easy to assemble and allows you to replicate the soundtrack of pretty much every single scifi movie on the 1950s in your home or office. And don't worry. ThinkGeek provides assembly instructions in English, too. It's $40 here. Enjoy all the fun of the zombie apocalypse without all the hassle of listening to Lori with these Walking Dead board games! We've already mentioned The Walking Dead Monopoly (and its amazing game pieces) but there's also a TWD Risk which, frankly, sounds kind of brilliant. They'll each from you around $45-50. You're going to have a damned hard time trying to find this amazing Bender figure before Christmas, and here's why": It's two feet tall, it's modeled after the amazing Shogun Warriors toys of the '80s, it shoots Bender's hands, and they only made 500 of them. But if you can, the person you give it to will never stop thanking you (even if it's yourself). It's $150 — good luck. There's absolutely no way to pick one of We Love Fine's multitude of nerdy T-shirts to pick from, so let me just say this: They consistently have the most clever, most interesting, and best quality nerd shirts on the Internet. Choose from Marvel characters, DC, Star Wars, Star Trek, Adventure Time, My Little Pony, and more, from shirts and dresses and leggings and underwear and etc. (and they have the best assortment of nerdy women's apparel, hands down). I defy you to fail to find a gift for your nerdy loved ones here. 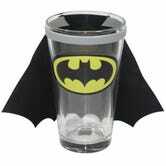 This is a pint glass with Batman's cape on it. Your argument is truly invalid. The cape does come off for easy washing (either the glass or the cape), which I'm sure Alfred will appreciate. You can order it for $12 from Amazon here. Beam yourself to cleanliness with this shower curtain designed to look like Star Trek's famous transporter room and a bath mat designed to look like the transporter's floor base. Don't don't let any red shirts take a shower in there, because you know they'll never come out alive. It's $50 at ThinkGeek. Okay, admittedly this is a stick, and you're probably not accustomed to paying $180 for a stick of any kind. But 1) this is scanned directly off the prop Ian McKellan used during The Hobbit, 2) it has the runes Gandlaf carved on it, 3) it's made of fiberglass so it won't break and 4) any stick you find on the street isn't going to look nearly as good, I promise. If you have a friend that's into Star Wars figures, I can personally assure you that he or she will love Hasbro's new Star Wars Black series, because it finally gives them what they've always wanted: 6-inch Star Wars toys (the new 3 ¾-inch figures — also confusing called Star Wars Black – are nice, but it's the never-before-done 6-inches scale that makes them awesome. Series 1 and 2 are available at most online retailers for around $18 each. 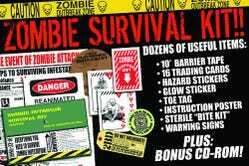 Sphereworx's Zombie Survival Kit is more about "decorating in case of zombies" than "surviving the undead apocalypse." But it should still make a fun gift for the undead lover in your life. IT contains "Outbreak Zone" warning tape, warning signs, hazard stickers, a Bite Kit, a toe tag and more. It's $22 over at Amazon. It's taken about 20 years, but Japan has finally gotten around to making high quality Sailor Moon toys. These FigurArts versions of the Sailor Scouts aren't cheap — they're usually about $20 each — but they're super-poseable and come with a multitude of different faces and accessories for the ultimate in Moon power. To be honest, I don't really expect anyone to purchase a pair of the official leather pants from Man of Steel, especially since they cost a mind-boggling $525 at Entertainment Earth. I just wanted you all to know that these exist, and someone truly expects people to buy them. It's the most powerful; artifact in the Marvel universe. Thanos used it to kill have of the entire universe. You can use it to open beers. That's awesome. It's $16 here.